Happy Saturday-it's going to be a sunny one in Florida! I'm so excited to be attending a Florida Blogger Meet Up today! Can't wait to meet new friends! Last week I blogged about my former students encouraging my current students by creating a wall of tips and cards for their big state writing test they took on Tuesday. 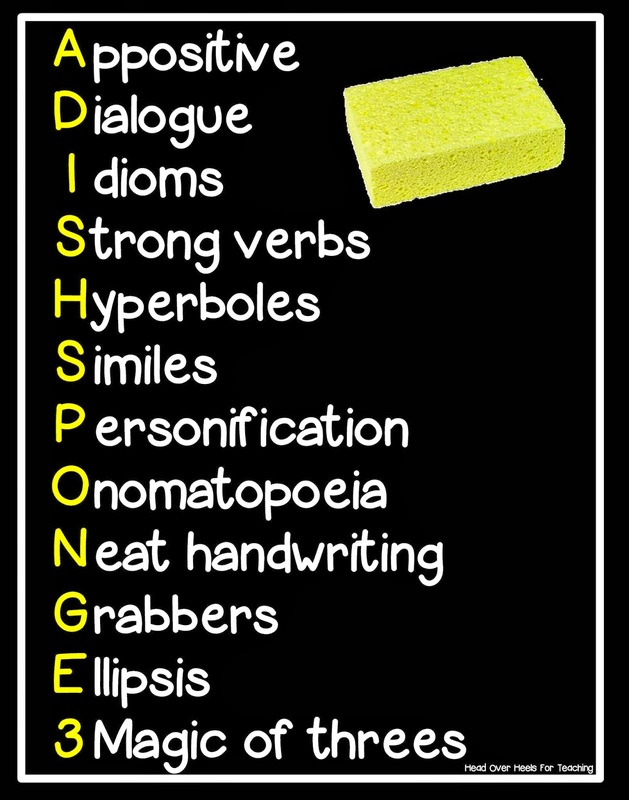 My students wrote, "Don't forget to use a DISHSPONGE" on their cards and on the wall, so, of course, MANY readers wanted to know about "ADISHPONGE" and what it meant. I needed an acronym that would make memorizing these skills easy for my students. Clever right? It originally started as just DISHSPONGE, the A and the 3 were added three years ago by another class! After teaching the above creativity skills, I give each of my students a sponge to put on their desks to remind them to use these skills in their writing. They love whipping out their sponges during writing! We practice memorizing the acronym on our desks. This is probably one of the BEST ideas I use to teach writing, it motivates them and gets them excited! That little sponge is used more than a notebook full of handouts & resources! Attention TPT Shoppers...the blue light is flashing in MY STORE until tomorrow evening! I wanted to extend the 20% off to those shoppers who missed the weekday sale! This is brilliant, Joanne! I love how you put a little sponge on everyone's desk as a reminder. I'm definitely borrowing this idea! I love this! What is the magic of 3? Awesome idea! I still have serious desk envy! I love the acronym, especially having the students write it on their desks. Wow! This is a fantastic idea. I MUST use this with my fourth graders. VERY creative. Now it is stuck in their minds...not in a journal! YAY! I LOVE THIS! Please, please, please don't let me forget about this! How did I not know you were going to a Florida blogger meet-up??? I'm so glad you shared what the DISHSPONGE was! I love how you give the students a little dish sponge too! You always have the best motivators. :) Can't wait to hear about the blogger meet up! LOOOOOOOOOOOVE a dishsponge!! You are the best!